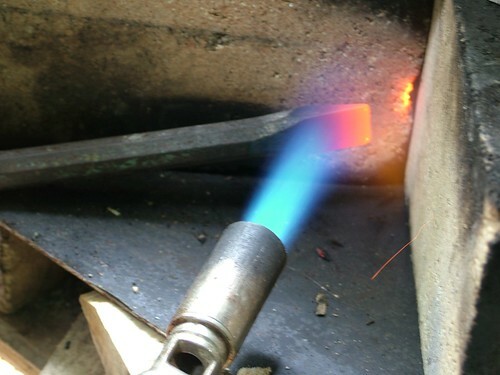 I’ve just spent a very enjoyable and instructive day with my friend Dave (who also happens to lay hedges) learning about the principles of heat treatment of tool steel. For those of you who have a sensitive disposition to non-wood posts – click away now! 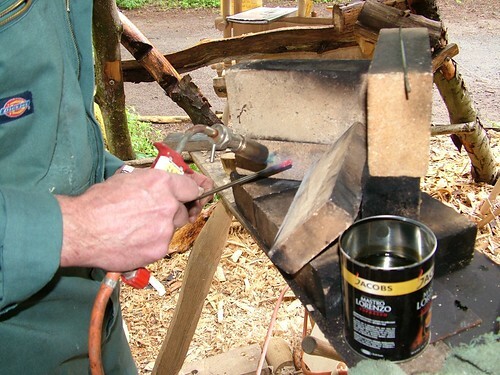 Here are a few pictures of what we got up to in my workshop. This is version 1. 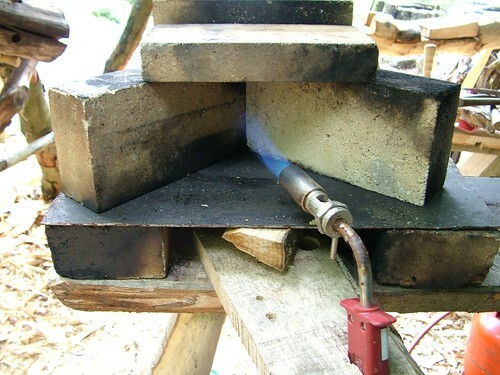 It’s built from firebricks which reflect the heat of the butane burner back onto the work without absorbing much, even better if the bricks are bright & clean (i.e. not partly blackened by having been part of my hand warmer over Winter!) as light colours reflect the heat better. 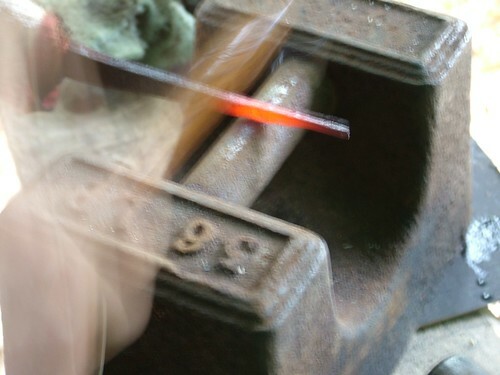 Then Dave showed me how to test the hardness of materials by a) filing and b) hitting with a hammer, which test a) hardness & b) brittleness. The silver steel Dave brought could very easily be filed and b) when hit with a hammer bent. 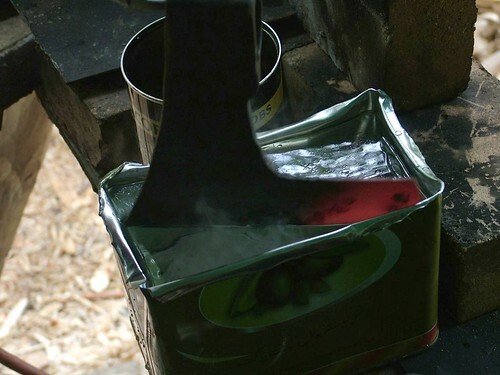 We sanded off the oil/oxide mess and then stropped it on my leather strop. 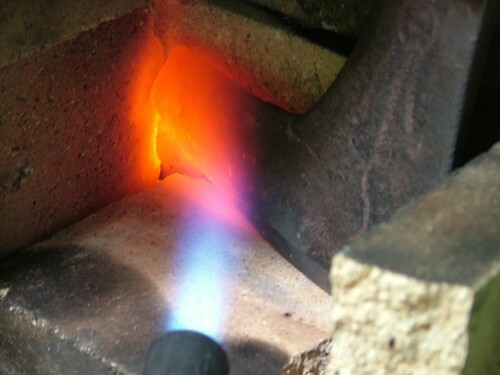 Heated it to a purple/blue, quenched and tested. Now a) the file skidded across the surface of the treated section, but b) did not shatter or bend when hit with a hammer. Hey presto! Soft steel turned into the stuff that tools are made on. Then after checking it really was hard (file just skids) we tempered it. 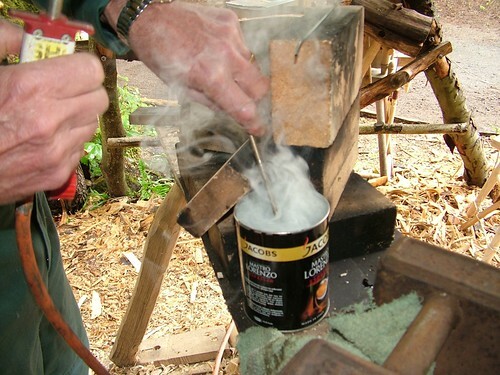 Now the torch is held fast in an improvised wooden vice so there’s no need to hold it. 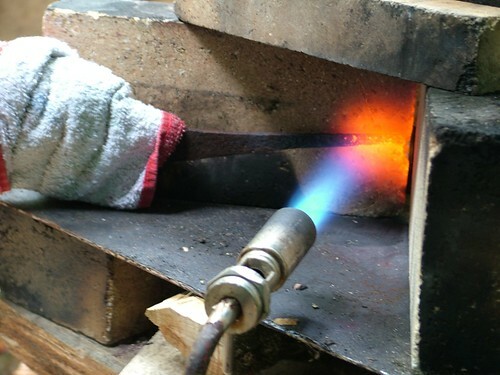 Then we heated up the tang for forging. It needed to be a bit longer so it needed to be drawn out. Then we had a go at the Bohemian bearded axe I bought on eBay a while ago. 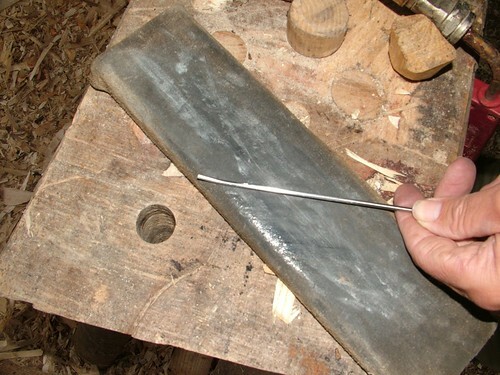 It has a soft edge that turns over (i.e, doesn’t hold its sharp edge) even when working green wood. 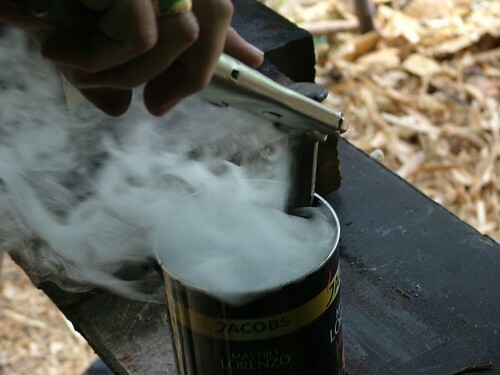 The question was did the steel contain enough carbon to be hardened, or was it a lemon that I’d purchased that looked good, but would never work as an axe? It turned out that we had a hard edge. 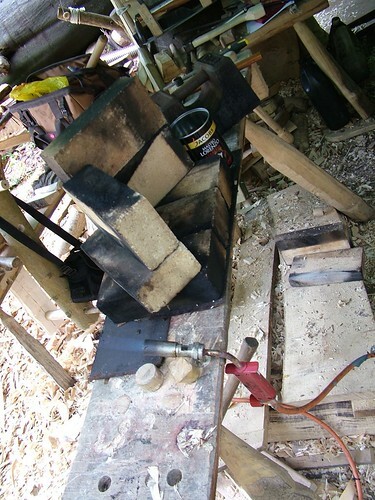 All I need to do now is get a charcoal forge working for heating up big pieces like axe heads, and for forging. Watch this space. Oh yes, and I finally levelled the chestnut bench before I set off for the woods, photo to come before I deliver it on Thursday. 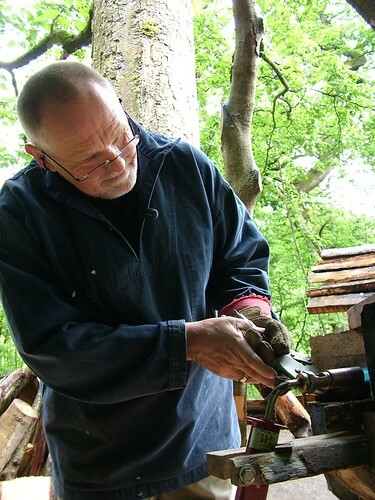 This entry was posted in Appropriate technology, Green woodwork, hand made, Slow and tagged blacksmith, brittle, firebrick, forge, hardening, hearth, quench, temper, tempering by Flying Shavings. Bookmark the permalink.